Children grow fast in a stimulating and challenging environment, with support and guidance from the teachers when needed and together they explore wide ranging, enquiry-based lessons from the birth of the universe through to the detailed grammar of English. Children attending Art class have a two-hour session once a week in the Art Room. These classes give the children the opportunity to develop skills, techniques and processes that will enable them to use art elements and principles to make aesthetic and creative choices to express themselves visually. By viewing artwork from their own culture and from other cultures and times, and through the introduction and use of specific language, concepts and ideas, the children are given opportunities to interpret, analyse and discuss their own and others’ artworks. The children immerse themselves in a deep learning experience through their own art making and through specific preparation for a significant gallery exhibition visit, where the children practise and develop their ability to look at art and make the most of a gallery visit. These skills are further developed and celebrated when all the children’s Art class artworks are displayed at the end of year Art Show. This is a time to honour the individuality, diligence and creativity of every art piece made by each child at particular times throughout the year, and is another chance to enhance gallery-visiting and art-viewing skills. The biology curriculum studied at Cycle Two introduces more detail into earlier explorations at the Cycle One level. Typically, children start to study the various classifications of plants and animals, which fascinates them at this stage of development. They begin to see the relationships between the natural environment and animals. They begin to develop an awareness of the importance of caring for the environment and of their own impact upon the natural world. They begin to understand the complex interrelationships between the many forms of life, the importance of the food chain and humanity’s place in all of life. The school employs a drama teacher to conduct weekly drama sessions with each class. The emphasis is on process drama so that every child, regardless of talent, has the opportunity to develop self-expression through drama activities. There is a whole school concert every year, usually in the middle of the year. Those who wish to take their drama further can participate in the Melbourne Montessori Players. This group meets every weekend and the culminating event is a wonderful production performed over 3 nights (with one matinee performance). From the fundamental beginnings covered at Cycle One level, in Cycle Two children further refine their understanding of the world in which they live. They reproduce maps of the world and of individual continents. They begin to plot capital cities and main landforms using Montessori materials called ‘Pin Maps’. This is quite a time-consuming activity that uses concrete materials to understand more detail of the world in which they live. Some children begin research on specific countries. Each of these ‘stories’ is supported by impressionistic charts and illustrations to inspire the young mind. Children in Cycle Two can be observed in animated discussion about such things as the coming of dinosaurs, the beginning of transport and the study of writing. The level of detail some students can recall is often quite amazing to the adult observing this energetic pursuit of, for example, what various dinosaurs are called. Children begin to understand and use Italian within the world of their own experience and imagination with some topics drawn from other areas of learning including exchanging simple personal information and opinions, and creating and performing short skits in the language. They start to recognise, read and locate items of information in short texts and write short sentences and paragraphs. Children at Melbourne Montessori School continue to fine tune their understanding of language through an integrated curriculum. Their oral work is supported by spelling, writing, reading, comprehension and listening activities. The study of grammar is a strong component of the Cycle Two language curriculum. As with all other areas of study, the children use hands-on Montessori materials in the first instance, moving to the abstract as their understandings deepen. Considerable time is spent at Cycle Two level in presenting the four processes and numeration concepts with a variety of Montessori materials. The aim of this is to provide concrete images in the child’s mind upon which to hang abstract thought at a later time in their mathematical studies. Each concept is taught using a variety of materials. For example, if working with a child on understanding addition, the teacher will use the golden bead material, the stamp game, the bead frames and the peg board. By seeing the process of addition represented in a variety of concrete forms, the child gains a deep and thorough understanding. Geometry also has a strong focus at this level as it is at this stage of development that the child loves the big names of mathematical language – triangular pyramid, quadrilateral, dodecahedron. All aspects of the state curriculum are covered, but using hands-on materials rather than pen and paper activities as the main teaching tool. 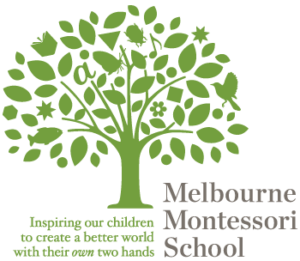 The Performing Arts program at Melbourne Montessori School is divided into the following areas: Cycle One Music, Cycle Two Music, Cycle Three Music, the Melbourne Montessori Choir and the Melbourne Montessori Orchestra. Cycle Two Music concentrates on each child learning the fundamentals of music theory through learning the recorder. All classes also participate in a one-hour lesson per week of generalist music teaching – music appreciation, singing, research-based learning and listening to performances from peers. A choral program is offered weekly for interested students. The Melbourne Montessori Choir performs at school events and also represents the school at local eisteddfods and inter-school competitions. Many of our students are extremely talented musicians, having learned an instrument for many years outside of school. As a community we have gathered this collective talent to create the Melbourne Montessori School Band Program. There are two levels to this program – the junior program and the senior program. Each band rehearses weekly with a view to performing publicly at every opportunity. A Musical Director oversees the entire music program, ensuring continuity, setting performance opportunities and coordinating the band program. While every student participates in weekly music lessons, there are opportunities for those who are passionate about music to really develop their talent further. We don’t just teach sport to children, we use sport as a mechanism to teach children about themselves. Children are exposed to the wonders and benefits that sports participation, competence and a healthy, active lifestyle bring. We encourage active involvement from each child through sport being made simple and learning made fun. Melbourne Montessori School also actively encourages families to park 4 or 5 blocks away from the school for drop-off and pick-up. This provides daily exercise, which is a well-documented health benefit for all. Children are introduced to all aspects of science through simple experiments, research and practical experiences. Discovery of the effects of magnets on various items, etc. The other aspect of Melbourne Montessori science that is experienced on a daily basis by the children is our program dedicated to environmental science and sustainability. The school harvests rainwater, composts, maintains a worm farm and is actively involved in a sustainability program through Glen Eira City Council. In the Montessori Cycle 2 classroom, your child will start to become more independent. They are shown how to plan their day and start to ask for lessons from the teacher. They manage their study of Mathematics and Language and begin research and project work.